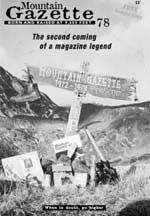 Presumed dead for nearly two decades, the Mountain Gazette, the rough-cut and barbed-tongued journal of 1970s mountain culture, has been exhumed, resuscitated and, according to its editors, "printed on paper so damned biodegradable ... that you can pour milk on it and eat it." Among its glossy newsstand rivals, the resurrected Gazette looms like a cornice both physically and in raw literary potential. But despite its oversized format and renegade bravado, the Gazette is anything but elitist or heavy-handed. Editors Curtis Robinson and M. John Fayhee "promise never to walk down the path of self-righteousness ... (nor) let too many good facts get in the way of a decent yarn." Contributors include a diverse tribe of mountain folk. Their writings range from Ed Abbey-esque ramblings (the Gazette is dedicated to Abbey, a frequent contributor of the original journal) to tales of ski-town misadventures. The obituaries offer homage to the passing of the Silver Plume Bar, environmentalist Dave Brower and adventurer Bill Danford. Poems with eclectic titles like Trophy Homes, The Secret to Staying Here and Above 10,000 Feet reflect the politics, impermanence and romance of contemporary mountain culture. The first edition is free, but from here on out, a copy will set you back $3 - the cost of a Flying Dog Beer at the journal's default editorial headquarters, Colorado's Woody Creek Tavern. Contact Mountain Gazette Publishing, P.O. Box 8087, Breckenridge, CO 80424 (970/453-4427) www.mountaingazette.com.